The outcome of the races and at Greyville next weekend could decide who will be crowned Equus champions. Next weekend is Super Saturday at Greyville which is the final big meeting of not only the KwaZulu-Natal winter season, but also of the 2017/18 season. There are four Grade 1 races on the card along with the eLan Gold Cup which is now a Grade 3 event. A lot of quality horses will be taking part and the outcome could decide who will be crowned champions in their respective categories when the Equus Awards are handed out next month. As a jockey you certainly want to be part of the meeting as there are a number of Grade 1 races and hopefully you can win one of the big races or even place as they all carry nice prize money. I have picked up a couple of nice rides but the races are competitive and it will be interesting to see if they are good enough to win. 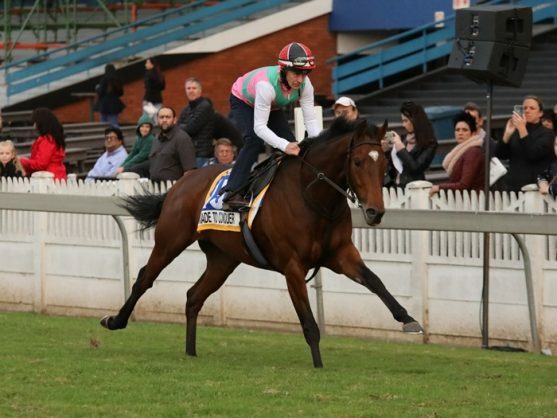 In the Gold Cup I will be riding Vodacom Durban July runner-up Made To Conquer but he is carrying top weight this time after he got 3kg penalty for his last run. I’m also riding Surcharge in the Champions Cup over 1800m. He has won the Grade 1 Daily News over 2000m at Greyville so he should enjoy the course. However, more about that next week. Today we race on the Inside track at Turffontein and without meaning to sound repetitive, you need to take draws into account as we often jump away on the turn and the shortest way home is an advantage. What many people might not realise is when you’re drawn wide on this track, you are not only disadvantaged by the draw itself. Punters do not know that in the back straight the track slopes away from the inside rail towards the outside so in order to overcome a wide draw you have to race uphill to get to the inside, so it is like a double whammy. For the record, the opposite applies on the Standside track. Race 1 is workriders’ race over 1600m where my first selection is Samurai Warrior. But that is only on form because he has the worst draw to overcome. So the main threat has to be Shanghai Pierce who has a good draw. Race 2 is a Juvenile Plate with my first selection being Walnut Dash. Unfortunately she also has a bad draw to overcome and that brings Countess Var into the race. This is not the strongest of field so if any money comes for the first-timer, Dream On, take note. Race 3 is a Maiden Plate and this time we have quite a competitive line-up. My first pick is Winter Storm but Gunston finished just behind last time. For the record, I have now picked up the ride on Gunston after Lyle Hewitson was injured at Fairview yesterday. The other big runner is Rocky Night who is also not far behind them on form. For the Place Accumulator go with Gunston and Winter Storm as it is a competitive race. Race 4 is a Maiden Plate with none of these runners standing out and a lot of the collateral form being quite close. For that reason consider all of Stormborne Thunder, Goede Hoop and Lana Turner for the PA and for the Pick 6 also put in Elusive Moon, Nessa The Dragon and One Dollar Massage. The horse I tried to get when entries came out was Stormborne Thunder . Race 5 is a fillies’ handicap and the horse we all have to beat is Invincible Lady. She was obviously my first call as I rode her last time and even though she just got beaten she was coming back from a six-month layoff and needed the run. She will be a lot fitter and this distance will be a lot better for her. She should be both a Place Accumulator and Pick 6 banker but if she is not your selection then consider Braxton and Jet Start. I’m riding Gottalottaluv who should find this distance too short for her. She is also unlikely to be course suited and the bad draw won’t help her either. Race 6 is a competitive handicap where my first selection is Sporting Monarch. His form is strong enough and he has a good draw. He was also the first call I made when looking for a ride. His danger should be Great Shaka but I’m not so sure if he’s a 1200m horse and the daw is not in his favour. He has then benefit of a 4kg claimer but I’m also not sure if the turn is in his favour either. You might just need to include Donny G in the PA as well and for the Pick 6 consider Copper Jay, Concealed Secret and Dan The Lad. Race 7 is another fillies’ handicap and my first call was for my first selection which is Dame Kelly. Unfortunately I couldn’t get the ride. The danger is Make Me Happy and they look the two for the PA.
For the Pick 6 the only other inclusion could be Spring Breeze who over this track with a No 1 draw should have a huge advantage. Race 8 looks very difficult and is the kind of race where one could consider the field for the Pick 6. For the PA go with Starcraft Prince, Front Rank, Kings Cup and Lock Him Up. I tried to get the ride on Starcraft Prince but I’m not sure whether he is effective over 1450m. Race 9 is another tricky handicap. My first phone call was to ride Hideaway and he is also my first selection. His dangers are Nottingham Forest and Viva Espana but she has a wide draw to overcome. Those are my three for the Place Accumulator. I’m riding Norland who must have a chance on form but unfortunately he has a shocking draw. For the Pick 6 put in all of those mentioned as a well as Moshav, Gimme Hope Johanna and King And Empire.